Army Medical Logistics Specialists are tasked with keeping track of medical supplies and equipment. This means receiving, storing, recording and issuing medical supplies for their units, and keeping superiors advised. This job, which is military occupational specialty (MOS) 68J, handles medical equipment and supply shipments, making sure they're deployed to forward areas in a timely fashion. 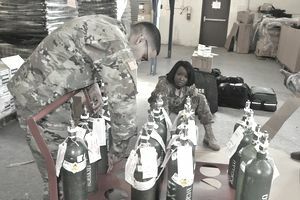 They don't just read orders and packing slips, however; these soldiers inspect and account for medical supplies and equipment to ensure everything is in compliance with Army Medical Department regulations. In addition to receiving and overseeing medical supplies, soldiers in this job create quality control programs, handle inventory controls, and all the various duties that go along with logistics, like requisitioning, packing and shipping. Knowing how to handle medical equipment in a controlled, sterile environment is a key component of this job; as is being able to count medical supplies efficiently to ensure they get to the right location. This work may sound a little like glorified bean-counting, but consider that troops around the world depend on getting supplies in a timely manner, and if there are discrepancies or if the equipment is damaged or broken, it has a ripple effect that could affect soldiers injured in the field. Medical logistics specialists also create quality control programs for incoming medical supplies and handle segregation, inventory control, requisitioning, preservation, salvage, and destruction of medical supplies and equipment when needed. The logistics specialists field is clerical by nature, but handling and safeguarding sterile and valuable medical equipment and supplies is unique to this MOS. Job training for a Medical Logistics Specialist begins with ten weeks of Basic Combat Training (boot camp) and five weeks at Fort Sam Houston, in San Antonio, Texas for Advanced Individual Training (AIT). You'll learn how to handle and store medical equipment, use computerized data systems to organize and maintain supplies, and how to operate vehicles like forklifts and cranes in a medical environment. You need a score of at least 95 on the clerical (CL) aptitude area of the Armed Services Vocational Aptitude Battery (ASVAB) tests. There's no Department of Defense security clearance needed for medical logistics specialists, but normal color vision is required for this job (so no colorblindness). If you're interested in this Army job, an interest in mathematics, bookkeeping, accounting, business administration, and typing will all prove useful. You should enjoy physical work; while there is a large clerical component to this job, you will be spending a fair amount of time operating forklifts and other warehouse equipment outdoors. The skills you’ll learn as an Army medical logistics specialist will help prepare you for work as a stock control clerk, parts clerk or storekeeper with factories, repair shops, department stores, and government warehouses and stockrooms. Since you'll have experience handling medical equipment, you may also be qualified to work in a pharmacy, doctor's office or hospital working with inventory and supplies.